Southampton claimed their first Premier League point under Ronald Koeman but were left frustrated as West Brom held them to a goalless draw at St Mary's. It was a dour game of few chances, with the West Brom defence proving too stubborn for a shot-shy home side. James Ward-Prowse came closest for the Saints with a 25-yard free-kick that flicked the outside of a post. Brown Ideye could have won the game on his Baggies debut but was denied by a save from home keeper Fraser Forster. It was a tough afternoon for the Saints, who remain without a win under Koeman but have at least now got their season up and running. Mauricio Pochettino's replacement had suggested before kick-off that this game would prove more difficult than the opener at Liverpool, a match few expected them to win but in which they impressed in a 2-1 defeat. And so it proved as a hard-working and disciplined Baggies display stifled the Saints. It was inevitable that a team under new management, looking to integrate so many new players following the sale of key personnel, would struggle for fluency. Only four players who started Southampton's first home game of the 2013/14 season started today's match against West Brom: Jose Fonte, Morgan Schneiderlin, Victor Wanyama and James Ward-Prowse. Last season, Adam Lallana provided the creative spark and Rickie Lambert the finishing touch to overcome stubborn teams such as West Brom. But with those two now on Merseyside, the Saints lack the attacking prowess to break down disciplined opponents. Dusan Tadic demonstrated his potential to fill Lallana's boots with another lively display. The Serb was responsible for most of the home side's positive contributions, producing a series of dangerous crosses as well forcing Ben Foster to save a low shot in the first half. However, Graziano Pelle was less impressive as a replacement for Lambert. The Italian spurned two good headed chances in the first half before fading into obscurity in the second, when he was paired with the equally ineffectual former Albion striker Shane Long. That Ward-Prowse's dipping free-kick - which clipped the outside of a post - was the closest the hosts came to scoring after the break is a testimony to the stranglehold the visitors had on the home attack. West Brom may have claimed only three away victories last season but already appear to be developing into an efficient unit under new manager Alan Irvine. They offered little in attack, but Foster was relatively untroubled in their goal as they held the home side at arm's length. Record signing Ideye had two good chances to give Albion only their fifth win of 2014 but put the first - a header at the back post - into the side-netting, before seeing the second saved superbly by Forster after he turned away from two defenders for a clear sight of goal. Southampton manager Ronald Koeman: "We didn't have the quality to create a lot. I was disappointed by the level we had today in an offensive way. "The first 45 minutes we built up too slowly and didn't surprise them in attack. I tried to change it but in the second half it still wasn't good." West Brom manager Alan Irvine: "I think both teams had their spells when they controlled things. We perhaps didn't create enough when we did have the ball. "We are a work in progress. It is not where we want to be right now but we are hoping for better going forward." Match ends, Southampton 0, West Bromwich Albion 0. 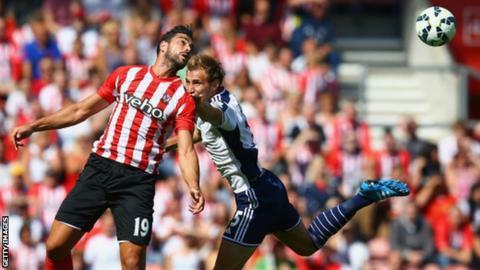 Second Half ends, Southampton 0, West Bromwich Albion 0. Corner, West Bromwich Albion. Conceded by Morgan Schneiderlin. Foul by Brown Ideye (West Bromwich Albion). Foul by Jack Cork (Southampton). Saido Berahino (West Bromwich Albion) wins a free kick in the defensive half. Craig Gardner (West Bromwich Albion) is shown the yellow card for a bad foul. Chris Brunt (West Bromwich Albion) wins a free kick in the defensive half. Attempt missed. Youssuf Mulumbu (West Bromwich Albion) right footed shot from outside the box misses to the left following a corner. Corner, West Bromwich Albion. Conceded by Ryan Bertrand. Attempt saved. Brown Ideye (West Bromwich Albion) right footed shot from the right side of the box is saved in the bottom left corner. Assisted by Graham Dorrans. Attempt blocked. Chris Brunt (West Bromwich Albion) left footed shot from outside the box is blocked. Brown Ideye (West Bromwich Albion) wins a free kick in the attacking half. Attempt missed. Saido Berahino (West Bromwich Albion) right footed shot from outside the box misses to the left. Assisted by Craig Gardner. James Ward-Prowse (Southampton) hits the left post with a right footed shot from outside the box from a direct free kick. Victor Wanyama (Southampton) wins a free kick in the attacking half. Attempt missed. Dusan Tadic (Southampton) left footed shot from outside the box misses to the right. Assisted by Shane Long. Attempt saved. Craig Gardner (West Bromwich Albion) right footed shot from outside the box is saved in the centre of the goal. Nathaniel Clyne (Southampton) is shown the yellow card for a bad foul. Jason Davidson (West Bromwich Albion) wins a free kick in the attacking half. Nathaniel Clyne (Southampton) wins a free kick in the defensive half.